An ectopic pregnancy occurs when a fertilized egg implants outside of the uterus, typically in the fallopian tube. Fallopian tubes and other locations are not suited for the growth of a fetus and an ectopic pregnancy is not able to develop properly. Ectopic pregnancies can be dangerous health emergencies that may require emergency treatment. When an ectopic pregnancy occurs in the fallopian tubes it may be called a tubal pregnancy. 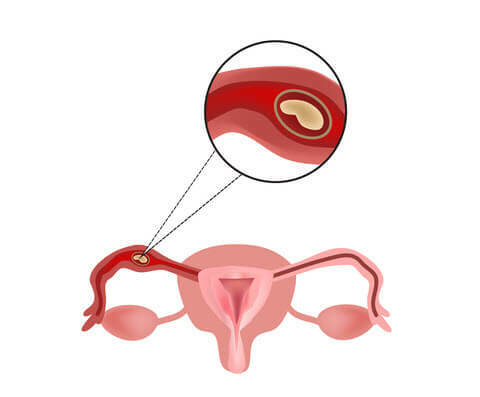 During ovulation, a fully developed egg breaks out of a follicle in the ovary and it is propelled into the fallopian tube. If sperm is in the fallopian tube when the egg arrives, fertilization occurs and the fertilized egg becomes a zygote. The zygote spends several days developing additional cells, transitioning into an embryo, and traveling towards the uterus. Once in the uterus, the embryo implants into the nutrient-rich endometrium, where it is supported into growing into a fetus. Some ectopic pregnancies may be recognized during the earliest weeks of gestation. While the pregnancy has not implanted correctly, the body would still recognize the fertilization and begin to release hCG, the pregnancy hormone. Thus, a home pregnancy test would indicate a pregnancy was occurring. However, early medical scans may detect the abnormality. However, some women may not be aware they are pregnant, or scans may be inconclusive. In these cases, the ectopic pregnancy may go undetected. In this case, there is a risk of fallopian tube rupturing, resulting in permanent damage or total loss of the tube. If not treated promptly, it can lead to maternal death. It is possible to conceive a successful pregnancy following an ectopic pregnancy. However, if a fallopian tube was damaged, fertility treatments may be required to aid the process. While the risk of having an additional ectopic pregnancy is increased with future births, close monitoring of following pregnancies will assist in reducing risk and potential harm.